Years ago one of my first silhouette projects was a 4 part birch tree silhouette. I love that design and was recently approached by a design firms to re-do it as aspen trees. 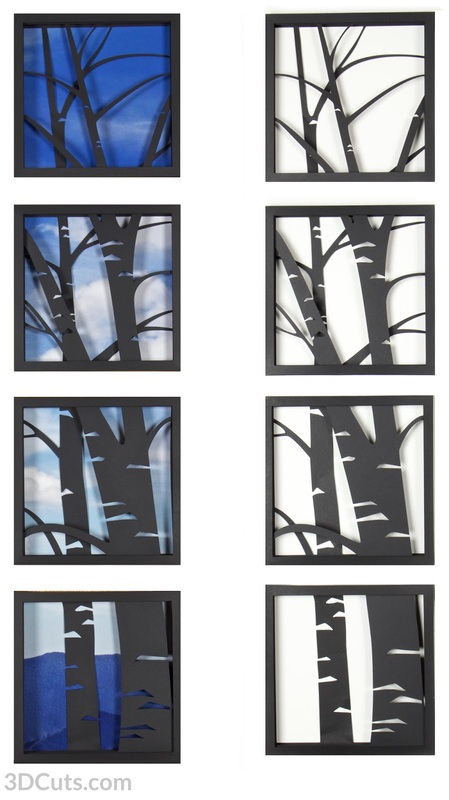 They were looking for a design to use as a wall mounted metal silhouette sculpture for the outside of a building and they especially liked my birch design. They hired me to adjust and modify the birches using the signature little triangles and create an aspen design. That project is done - but I did retain the rights - so I have adjusted it, made it two levels and put it in a paper frame for paper crafters to make on a much smaller scale. I recently finished the 3D Aspen Shadow Box design. This shadow box can be created with no back ground letting the color of the wall show through or with a inserted background of either a photograph or solid colored paper. In the design on the left I inserted a photo I snapped in the Great Smokey mountains a couple of weeks ago. I just opened it in Pixelmator and cropped it into 4 squares to fit. Back to the design commission.....I don't know where the building will be located that will have a forty foot tall version of this design on its outside wall but based on the communications I have been told it will be a motel. I also know the project name has Durango in it so I am assuming next year some time (2018) this might appear in Durango, Colorado. If anyone sees the final install please snap a picture and send it on to me. If we should get down to Durango sure will take photo of your design. What a wonderful compliment you were commissioned to design that. Surely they'll send you a photo of it when completed. We live bit away from Durango but who knows where we might go in next year. We live in western CO, on west side of Rockies, closer to UT border in little town called Loma, few miles west of Grand Junction. Beautiful design, loved it. If my eyes were better and hands worked better would buy file from you. I have asked the design firm to send a photo but those are the kind of details that get lost in a project. Durango is on my list of places to visit. I have been to Loma but not Durango.